Major discovery – spread the word! I had never heard of Dutch composer Daniël de Lange (1841-1918), and I doubt that many music lovers outside of the Nettherlands (and even there…) will have. He’s very scantily represented on disc (other than his, mainly through his First Symphony on Sterling CDS 1068, barcode 7393338106821, also found under 675754902827), there is only one score of his on IMSLP, he doesn’t get an entry on English Wikipedia (but does in Dutch). He was born in Rotterdam to a family of musicians, was trained as a cellist and from an early age was well-travelled as a performer in a piano duet with his older brother, Brussels, Vienna, Poland, Ukraine, Romania, finally establishing in Paris in 1865, where he is said to have had Ernest Chausson among his private composition students. He moved back to Amsterdam at the outbreak of the Franco-Prussian war, and there he was noted for founding a chamber choir active in the rediscovery of the choral repertoire from 1400 to 1600. In his later years he adopted the mystical-esoteric elucubrations of theosophy which were much in vogue at the end of the 19th century, to the point of moving to the movement’s American headquarters in Point Loma, California, where he died in 1918 (about theosophy and Point Loma, here’s a very thorough online source: W. Michael Ashcraft’s “The Dawn of a New Cycle – Point Loma Theosophists and American Culture”). Although De Lange attained some repute in his native Netherlands, it was more as a musicologist, choral conductor, cello teacher and founder of the Amsterdam conservatory, than as a composer. His major works – the Requiem, two symphonies – were never published, the second symphony is lost and the Requiem was long thought to be as well. The manuscript was rediscovered only in 1972, and a performing edition was established only in 1992, leading directly to this recording. The Requiem dates from 1868 during De Lange’s Paris sojourn. It’s a magnificent work, and a very original one too. First, it is sung a cappella. 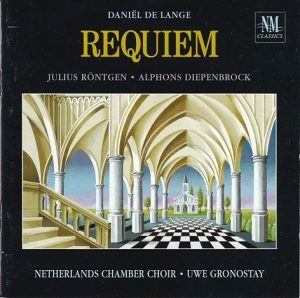 Now you won’t find many a cappella Requiems between the 17th and the 20th Century. Other than Rheinberger, who wrote one such piece, alongside a cappella masses and stabat maters, I don’t see… Second, the Requiem isn’t a work that shows off and brags, and a casual listening may miss its great beauties. Fauré may come to mind, because it isn’t an imposing and grandiose requiem like those of Berlioz or Verdi – although there is much drama in the Dies Irae section. In fact, one of its beauties is that the moods graphically follow the words and meaning – someone uploaded the recording on YouTube, with score, very useful, much gratitude, and it is very rewarding to follow the music with the score, to catch all the mood swings and the precision of expression. Finally, while it pays tribute to its glorious predecessors from the 14th to 16th century, it offers some daring harmonic turns that, on a blind test, would have made me categorize it as a late-19th or early-20th century composition rather than one from 1868. A comparison with Rheinberger’s touching but way more predictable, way more 19th-Century-anchored a cappella Requiem op. 84, which you can also hear on YouTube, is telling. I find De Lange’s intemporal. It deserves to be universally known and picked up and promoted by every choral organization. His First Symphony is also on YouTube. It’s not nearly as original and memorable as the Requiem. Comparison with the two complements featured on the CD, by the way more recognized Alphons Diepenbrock (1862-1921) and Julius Röntgen (1855-1932), is also telling. Both Cælestis Urbs Jerusalem (1897) and the Three Motets (1920, 1929) are pretty, but they sound much more impersonal. Although composed at the threshold of the 20th century, Diepenbrock’s Cælestis sounds harmonically predictable and 19th century romantic, and Röntgen’s Motets, at best, like works Max Reger could have written.. if not Rheinberger. Both are ultimately unmemorable. 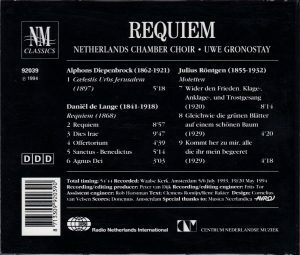 But De Lange’s Requiem is the major find here, and it is a pity that this recording, now more than 20 years old, didn’t lead to a major rediscovery. Spread the word!